In geological terms, Iceland is a young island. It started to form about 20 million years ago from a series of volcanic eruptions on the Mid-Atlantic Ridge. The Iceland hotspot is likely partly responsible for the island's creation and continued existence. Iceland remained for a long time one of the world's last larger islands uninhabited by humans. It has been suggested that the land called Thule by the Greek merchant Pytheas was actually Iceland, although it seems highly unlikely considering Pytheas' description of it as an agricultural country with plenty of milk, honey, and fruit. The exact date that humans first reached the island is uncertain. Ancient Roman coins dating to the 3rd century have been found in Iceland, but it is unknown whether they were brought there at that time, or came later with Viking settlers, having circulated as currency already for centuries. There is some literary evidence that Irish monks had settled in Iceland before the arrival of the Norse. However, there is no archaeological evidence to support such settlement. 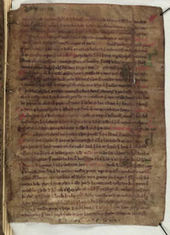 The 12th-century scholar Ari Þorgilsson wrote in his book, Íslendingabók, that small bells, corresponding to those used by Irish monks, were found by the settlers. No such artifacts have been discovered by archaeologists, however. Some Icelanders claimed descent from Kjarvalr Írakonungr at the time of the Landnámabók's creation. According to Landnámabók, Iceland was discovered by Naddoddr, one of the first settlers on the Faroe Islands, who was sailing from Norway to the Faroe Islands, but got lost and drifted to the east coast of Iceland. Naddoddr named the country Snæland (Snowland). Swedish sailor Garðar Svavarsson also accidentally drifted to the coast of Iceland. He discovered that the country was an island and named it Garðarshólmi (literally Garðar's Islet) and stayed for the winter at Húsavík. The first Scandinavian who deliberately sailed to Garðarshólmi was Flóki Vilgerðarson, also known as Hrafna-Flóki (Raven-Flóki). Flóki settled for one winter at Barðaströnd. It was a cold winter, and when he spotted some drift ice in the fjords he gave the island its current name, Ísland (Iceland).